4. Citroen GT | What Car? 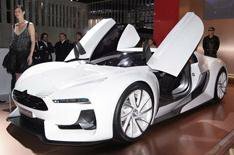 This is the Citroen GT, a car that is never going to be sold, yet which is displayed in Paris in its final form. How so? Because it has been built purely to be featured in the next Gran Turismo PlayStation game. The marketing people at Citroen believe the deal will help promote their brand among the youth market, giving it a cooler, more sporty edge. As a result, there's no engine size, power figures or other details to give you, save to say that it's a two-seater, features gullwing doors and, promises Citroen, has handling to rival a supercar. Why we didn't like it Because it looks so damn good - yet it has no hope of making production.